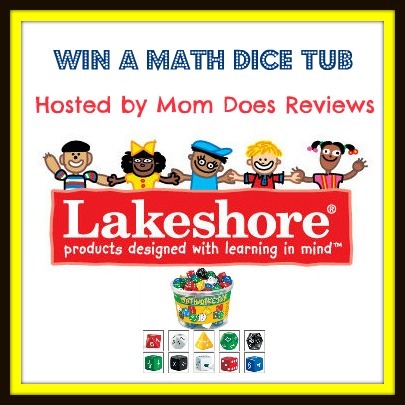 One Mom's Moxie: Math Dice Tub Giveaway!! A Fun Way To Learn Math!!! Math Dice Tub Giveaway!! A Fun Way To Learn Math!!! Keep Learning Fun with Lakeshore! Lakeshore specializes in early childhood education programs and supplies for classrooms and homes nationwide. Lakeshore is dedicated to creating innovative educational materials that spark young imaginations, instill a sense of wonder and foster a lifelong love of learning. With materials for infants & toddlers through the 6th grade, we help children reach developmental milestones and achieve educational goals—while still having fun! We know that each child is unique, and we strive to develop materials that appeal to children of all interests, backgrounds and abilities. And, of course, all of the products we carry must meet stringent quality & safety standards—so they’re strong enough for daily use in the classroom and safe enough for use by babies and children. The Math Dice tub is packed with 90 dice in a variety of styles, including polyhedron dice in 5 different shapes, number dice, dot dice, fractions, operation signs…even blank dice! With a guide. There is nothing better than playing math games during summer vacation! My son loves school so getting him to do school work during the summer is pretty easy. He loves math so this game is perfect for him. He made a up a few games already and forced me to play them, LOL. We plan on using them to practice Multiplication tables and working on division and fractions. He learned probabilities at the end of 3rd grade so we can do one of the suggested games. There are so many types and shapes and colors of dice to keep kids busy from ages 4 to 12. They are pyramids, cubes, and other polyhedra. Yes! Math can be fun with the right tools! 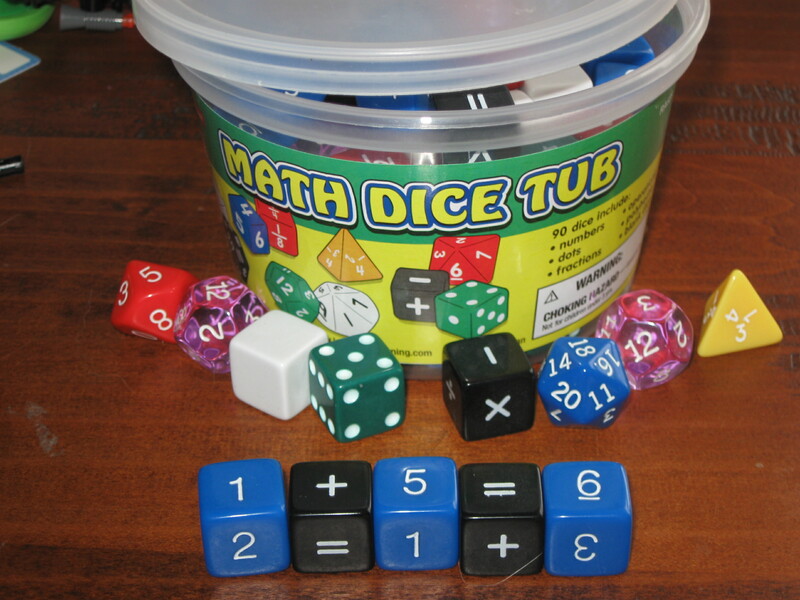 Enter below to win your won Math Dice Tub and keep your kids happy and learning all summer! I highly recommend the Math Dice Tub for children ages 4 to 12. Simple games and addition can be done for the youngest children and harder probabilities and equations can be done for your 6th grader. I love a product that has something for kids of all ages. Disclosure: I received this product for review purposes only. I was not given any monetary compensation. All opinions are 100% my own. “Like” Lakeshore’s Facebook page. "Follow" them on Twitter. Special thanks to Mom to Bed by 8 and One Mom's Moxie for joining me on this fun giveaway.